Gate Reality partnered with The Bleacher Report to film two NBA celebrities showing off their basketball talents around the viewer. We then set up a fun "reveal" activation wherein fans watched the VR experience and, after removing the headset, were surprised to see their heroes standing in front of them! 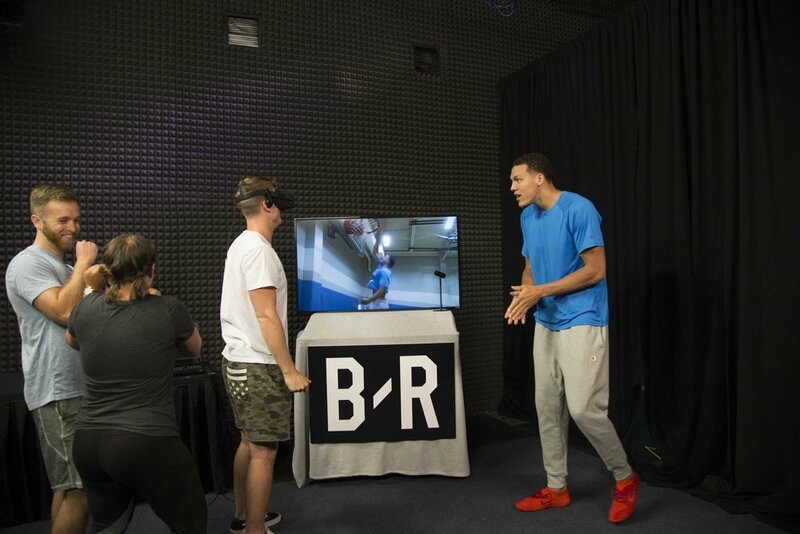 De'Aaron Fox of the Sacramento Kings and Aaron Gordon of the Orlando Magic are both very talented celebrities of the NBA and it was great to showcase their abilities in immersive 360º. Using the brand new Kandao Obsidian S camera we were able to shoot at 60fps- ideal for fast moving sporting action. Aside from recording their supreme dribbling and shooting skills, we were able to record them jumping over the camera and throwing the ball at the camera, which as a viewer, really enhances the feeling of being there, in a one-on-one with the player. These were scary moments for our new camera but luckily the accuracy and mobility of the athletes was reliable! For the “Reveal” part of the project we returned to Sacramento and Orlando and set up the headset experience. We built an app that could seamlessly loop the video and we used the Oculus headset to ensure high quality playback. Our production manager, Alan became an unintentional worldwide celebrity thanks to appearing in both Bleacher Report videos. So far there have been 7.2 million views, and counting! This was a thoroughly enjoyable headset experience for Gate Reality to be involved with. Firstly, getting to know 2 celebrity basketball players in their element (their home-town gyms) and secondly creating the headset “reveal” for their fans.